April 28 marked the seventh month that religious leaders, motorcycle riders, low-riders and community activists have united to spread their message of peace throughout South L.A. neighborhoods and the rides keep getting better and better, participants say. Donning signature protective helmets and leather jackets identifying each of their clubs, the riders began their mobile campaign for peace at the Magic Johnson Park in South Central Los Angeles. “The significance of peace is the void which our community needs. What the ride is doing is filling in a vacuum that people are longing for within ourselves, because we have been under the stench of self-hatred for 400 years,” said Student Minister Tony Muhammad, Nation of Islam Western Region Representative and a co-host of the Peace Rides. “Now to see peace being promoted on the fringes of a 40-year gang war actually answers the cries and prayers of all the mothers who’ve lost their children to gang violence,” Minister Tony added. 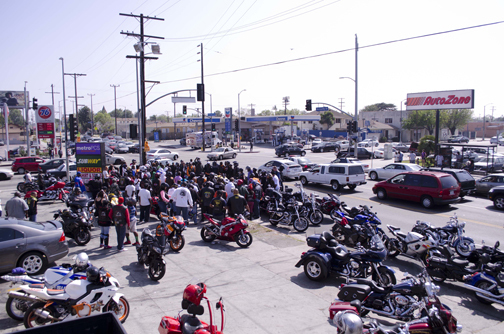 At one point during the ride, hundreds of bikers converged on the intersection of Florence and Normandie. Traffic backed up with motorists who drove by, blowing their horns, and throwing up the peace sign. The caravan stopped at Florence and Normandie to commemorate the 21st anniversary of the 1992 L.A. Rebellion, also known as the “Rodney King riots.” The area erupted into civil unrest after a predominantly White jury acquitted three of the officers (and deadlocked on one) who were videotaped beating King, a Black motorist. The cyclists, which included Min. Tony, Reverend Alfreddie Johnson, founder of the World Literacy Crusade in Compton, community activists, and several other Christian pastors, handed out Million Man March Pledge brochures and the Way to Happiness booklets, which are guides to better living. The infamous intersection seemed to transform into a great portrait of cooperation between the police, the city, and a people longing for peace. “It’s an important thing. We always promote peace and there’s a lot of violence going on. I’ve lost club members to gang violence and just violence period, so anything to promote, for us to get out for a good cause, I’m all for it,” said Lil’ Moe of the Street Heat Riders motorcycle club, when interviewed during a previous ride. He said his club always practices safety and to obtain peace throughout L.A. County and worldwide, he feels there must be a starting point. When he heard Min. Tony speak about the rides, he was all for it, he continued. Approximately 22 bikers with the Street Heat Riders have participated in the rides, according to Lil’ Moe. “My club was behind me so we’re putting our best foot forward to promote peace,” he added. The caravan also stopped at Jesse Owens Park before ending their journey at Leimert Park. They were treated to a Hip Hop concert in front of the historic Vision Theatre. “There was a lot of love and unity,” an unidentified woman stated, amid the sound of roaring bikes and music blasting from loud speakers. “It felt very spiritual. It was very engaging to see so many races of people standing in love and unity for one common cause, so we can live in peace together,” she said. Rain or shine, they’ve conducted the rides since October 2012, in commemoration of the historic Million Man March: Holy Day of Atonement, according to Min. Tony. The Honorable Minister Louis Farrakhan, leader of the Nation of Islam, called one million Black men to Washington, D.C. to atone and pledge to be better fathers, husbands, and stewards in their communities. The Peace Rides are an extension of that atonement. They stem from Minister Farrakhan personally leading Black men in the Nation of Islam into the streets of Chicago, across America and abroad to help stop violence and restore peace, Min. Tony informed. The Peace Rides are also a build up to the United in Peace Festival, which is slated for some time in October. In 2012, during a weekend of hot violence, Min. Tony informed, he received a call from radio talk show host, Big Boy of Power 106 FM. They discussed Min. Tony’s idea of the Peace Rides and planning for the UPFest and the rides began, according to Min. Tony. “We have all religions, different gangs, different colors of people riding for peace, going throughout some of the inner cities ... To bring peace and harmony and then ending up in a park with a concert for families, so we’re very excited and pleased that this movement is taking on a life of its own,” said Rev. Johnson about the rides.